Is there a vegetable that you are secretly obsessed with? There is one that is always on my mind. 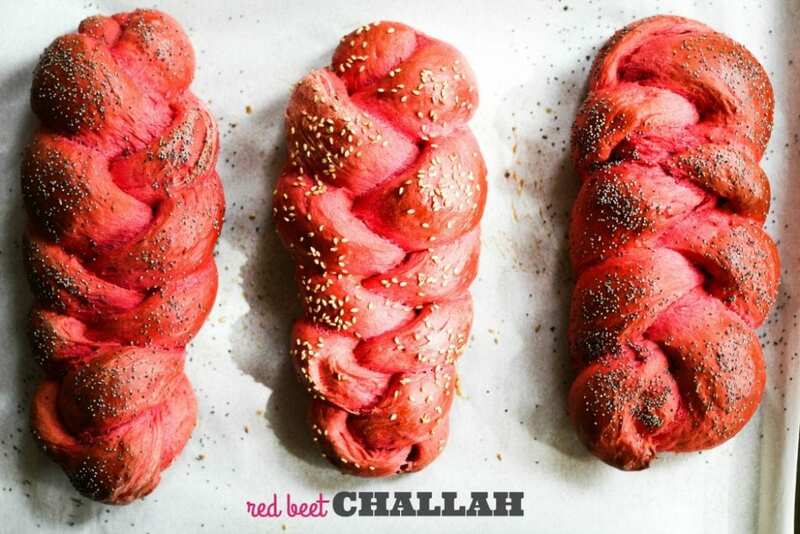 Can you guess by seeing this stunning red beet challah. 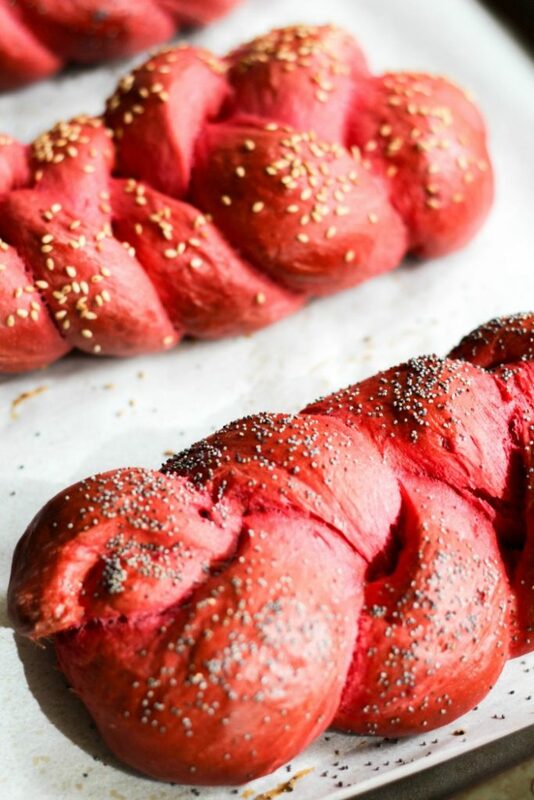 Maybe I’m exaggerating by saying always, but if you’re here today to see this red beet challah up close, then you maybe will guess it’s beets! I’m not a picky beet lover. I will honestly say that I have deep affection for red beets and stunning golden beets. I have so many ideas of what to do with them; it’s sad to say that I’m the only one here that shares this deep beet affection. So there aren’t too many crazy beet experiments. The taste testers have their favorite veggies, and I usually stick with them! This beet thing all came about for the nifty bread baking group I created a few years back. It’s just a lovely group of bloggers that has a similar obsession with baking their own bread. And some months the theme really inspires me! Like this “red” theme chosen by my super talented bread baking friend Heather. She’s one of the most creative people I’ve ever met through my little blog and I actually first found her and her delicious blog through a bread group she used to run. Imagine if we lived near each other? There would be more bread around than we would we would know what to do with it! So Heather threw out there this idea of red breads for February and my mind started spinning with ideas. I was leaning towards ideas that involved berries or tomatoes, but I wanted to do something more seasonal. Beets come around in the fall, and I as soon as I notice them at the market, I have ideas, most of them involve a beet soup. I did share a beet recipe here almost 3 years ago (yikes! ), but that is not the last time I roasted them up here. Here’s another really delicious beet idea, and for your excitement, it involves quinoa! I forgot how much I loved this salad! #TwelveLoaves is a monthly bread baking party created by Lora from Savoring Italy and with the help of Heather of All Roads Lead to the Kitchen, which runs smoothly with the help of our bakers. This month we’ll be baking breads with a RED theme in honor of National Heart Month, Valentine’s Day, and the Oscars (red carpet) – any red ingredient goes! Check out this gorgeous color! I will warn you, you may need to wear gloves if you don’t like your fingers turning fuchsia. I totally never mind when I work with beets. The color washes off pretty quickly. 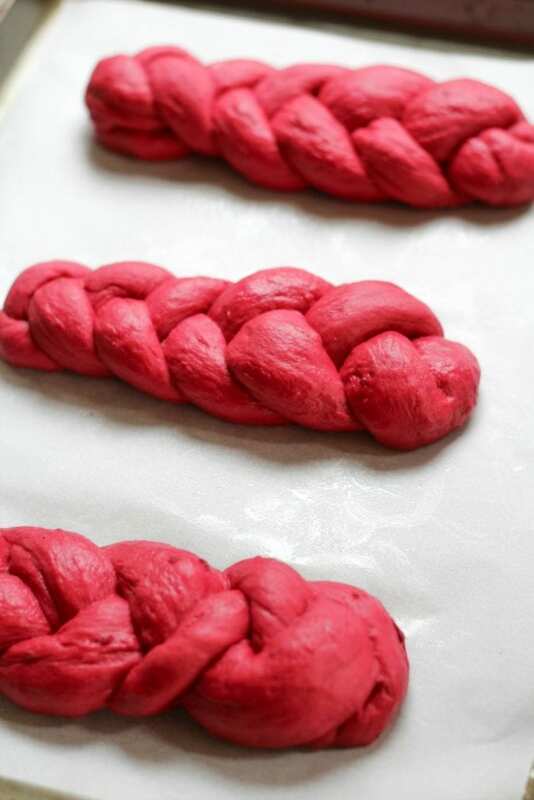 I had to make challah, mostly because it’s been so long, and when I thought of the color, I envisioned them braided. In Italy, they call a braided bread a treccia. And with beets? Treccia di pane alla barbabebietole. Yes, that is a mouthful! Barbabietole is one of my favorite Italian food words! In one of my all-time favorite parts of Italy, Alto-Adige (or, The Dolomites), they eat l’hefezopf (treccia di pane dolce), which is a sweet braided bread. The story of this region goes that when the men passed away, they would be buried with their wife’s braid (what…what?!? )and then it evolved into being buried with her braided bread (that sounds a little better than cutting off your whole braid). So it is enjoyed in Alto Adige on All Saint’s Day and even on Easter. Some notes on this recipe: I roasted the beets just as they were, no olive oil or any salt, and then when blending them up in my blender, I added a little milk. I started with a 1/4 cup, and added a bit more at at time until it was fully blended (it ended up being 1/2 cup). I did use 3 red beets. It did render the challah dough I normally do much more moist, so I ended up using about 5 1/2 cups of flour. You could use bread flour or all-purpose. I made one large braid and 3 smaller ones. You could make 2 large ones and freeze one or give one to someone special that enjoys homemade bread. It’s really easy to put together!! You just have to roll out your 3 strands, pinch the top of the ends of the strands together, and start braiding. Try to keep the pieces snug as you flop them over each other. I think that’s the trick. It gets easier with practice, so you have to make more bread!! 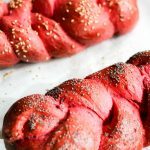 The kids loved the vibrant color…my son called it the “volcano bread” because he thought it was the same color of the lava from the Finding Nemo volcano…so there you go, bake a volcano bread for your kids! 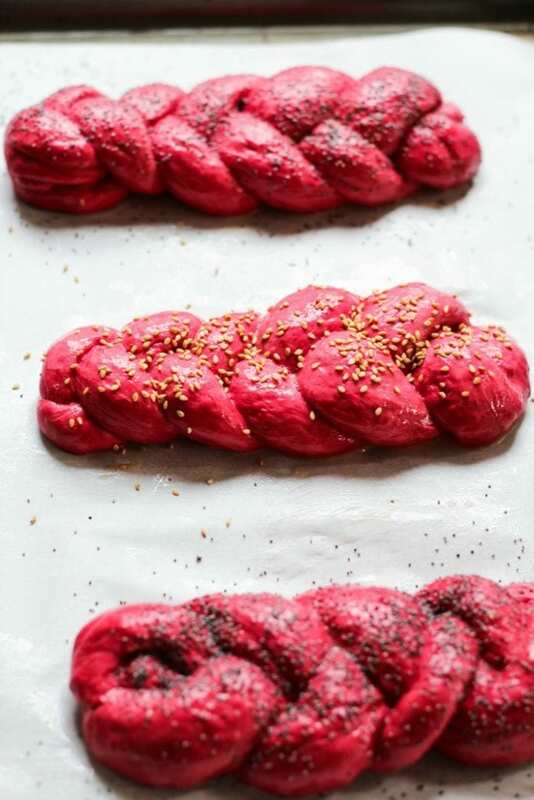 A soft and fluffy challah bread made with beets! 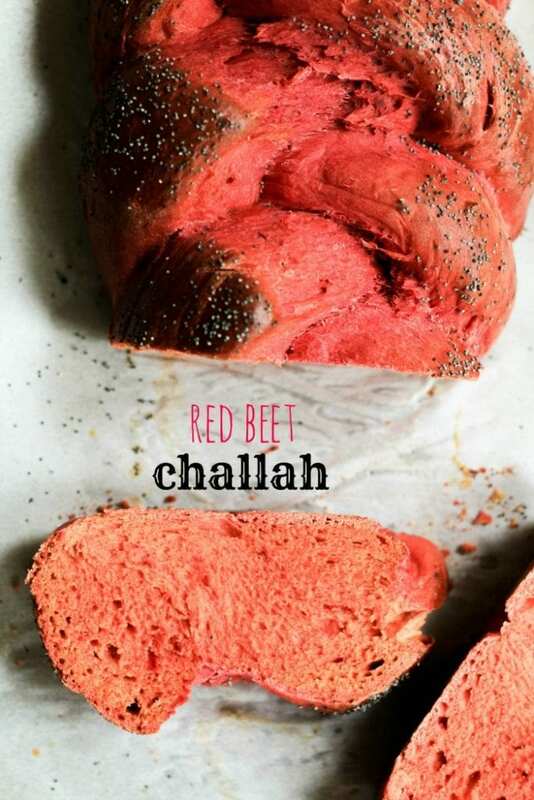 This Red Beet Challah has the must stunning color and is so good! In a blender, puree the roasted beet pieces with the milk (start with 1/4 cup and add more as needed to puree it until smooth). In a mixer, with a dough hook attachment, add the warm water and yeast. Mix until blended. Add the sugar and mix about a minute. Slowly mix in 1 cup of the flour until combined. Mix in the eggs one at a time until they are combined. Add in the pureed beets. Add another 2 cups of the flour, oil, and salt. Mix together on medium-low speed stopping the machine to scrape down the sides of the bowl. Slowly add the rest of the flour (the remaining 4 cups) and mix until combined. Stop the machine as you add each cup of the flour to scrape the sides of the bowl and incorporate the flour. Mix on low speed for 12 minutes until dough is incorporated. Be sure to give your mixer a break and as you don’t want to burn it out. Add flour if needed 1 tablespoon at a time. The dough will be a little sticky but also firm. Take dough out of mixer bowl. Punch down the dough. Divide the dough into 6 equal portions. Shape each portion into a ball, and allow it to rest with plastic wrap on it for 5-10 minutes. You could divide the dough into 9 portions to make 3 smaller loaves. Roll each dough ball into long piece .Braid 3 strands together to form a loaf. Repeat with the other 3 strands. Cover and let rise in a draft free place for about 45 minutes to 1 hour. When ready to bake, brush with egg wash. Sprinkle with poppy seeds or sesame seeds. Bake the challah for 35-40 minutes. The bread should be golden brown. Ovens may vary so check your challah at about 30 minutes and see how it’s doing. You test if it’s done by tapping the bottom of the loaf. If it sounds hollow, it needs a bit more time. * Be careful to not burn your fingers like I did when you do that test. Let it cool and serve slightly warm or at room temperature.